TEAMING UP: Club Mudgee director Brian Algie, CEO Maureen Heywood, VRA Mudgee squad captain Brian Wells, Mudgee VRA secretary Garry Dollisson, Club Mudgee director Dave Holden, Mudgee VRA vice-president Wayne Joseph and Club Mudgee president David Nelson discuss plans for fundraising for a new truck for the squad. A meeting last week to allow community groups to share ideas and discuss possible projects has had immediate results. About 50 representatives from 19 community groups and service clubs accepted an invitation from the Rotary Club of Mudgee to attend the meeting at Club Mudgee on Thursday. 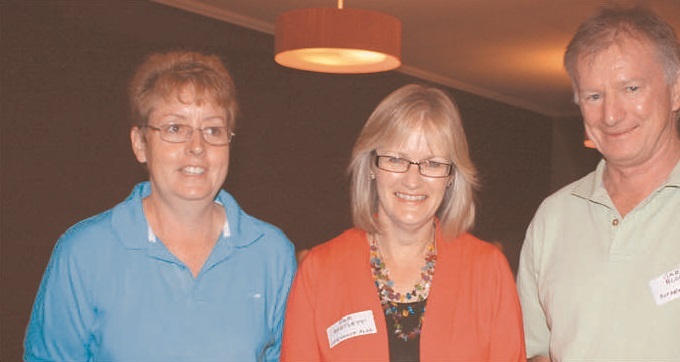 Mudgee Rotary president Val Webb said the evening was held to allow community groups to discuss their projects, identify how they could help each other and talk about a possible shared project. Groups represented at the meeting were: 1st Mudgee Scouts, CWA Mudgee Day branch, CWA Mudgee Evening branch, Mudgee Lions Club Rotary Sunrise, Mudgee VRA, Kanandah Auxiliary, Lifeskills Plus, Vision Impaired (Black and White Committee), Legacy, Club Mudgee, Blind Citizens Australia, Mudgee Rotary, Mudgee Men’s Shed, Gulgong RSL Sub-branch, Children’s Medical Research Institute, Can Assist, Pioneer House Ladies’ Auxiliary, and Grattai CWA. Speakers discussed needs ranging from new equipment to cater for the growing number of Scouts and Kanandah Auxiliary’s search for an accessible venue for card parties, to Lifeskills Plus goal to raise $2.5 million for a purpose-built facility to replace its rented Perry Street premises for services for people with intellectual disabilities. The meeting also heard how enterprising local groups raised money for a long list of causes. These included the Scouts’ plans for carwashes to raise some of the $50,000 they need to upgrade their hall as well as fees to attend the national Jamboree in Queensland, Legacy’s fund¬raising to provide lunch and social outings for war widows and the Mudgee branch of the Children’s Medical Research Institute, a group of 30 women who raise around $15,000 a year. But it was a plea for assistance from the Mudgee Volunteer Rescue Association (VRA) to raise $105,000 to replace its 27-year-old truck that brought an immediate response. Following the meeting, Club Mudgee CEO Maureen Heywood, president David Nelson, and directors Brian Algie and Dave Holden approached VRA representatives with an offer to assist with fundraising for the truck. Club Mudgee will direct funds raised from its next Afternoon on the Green to the VRA, as well as proceeds from its charity race day. Mudgee Rotary was delighted with the response to the meeting which they hope will help participating clubs to work more closely together. A community centre is high on the list of major projects participants said they would like to see undertaken in Mudgee. In response to Mudgee Rotary president Val Webb’s invitation to “dream” about projects to fill needs in the district, community groups listed possibilities including a senior citizens centre on level ground, day respite centre, shower facilities for out-of-town residents, a mothers’ room, bike paths, cultural centre and facilities for youth. Participants agreed that a multi-purpose community centre could meet many of these needs. REACHING OUT: Liz Sanders of Mudgee Scouts with Pam Bartlett of Lifeskills Plus and Gary Bloggs of the Rotary Club of Mudgee Sunrise, which has offered to help the Scouts with equipment. 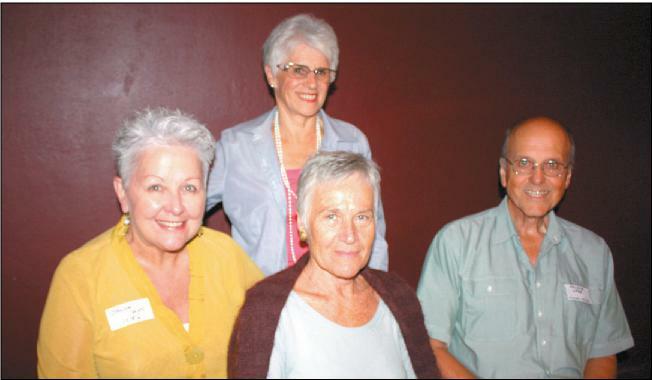 LET’S TALK: Bronwyn Sams of the Mudgee branch of the Children’s Medical Research Institute (CMRI), Marie Croom of the Mudgee CWA Day branch, Anjo Tarte of the Mudgee CWA Day branch and Mudgee CMRI branch and Maurice Webb of Mudgee Rotary chat at the community networking meeting. This entry was posted in Media by mudvra. Bookmark the permalink.